America Media in partnership with Jesuit Refugee Service/USA, the Jesuit Schools Network and the Embassy of the Kingdom of the Netherlands are pleased to publish the winner of the 2018 Anne Frank Essay Competition. Congratulations to James Chapman, a sophomore at Creighton Prep in Omaha, Neb. 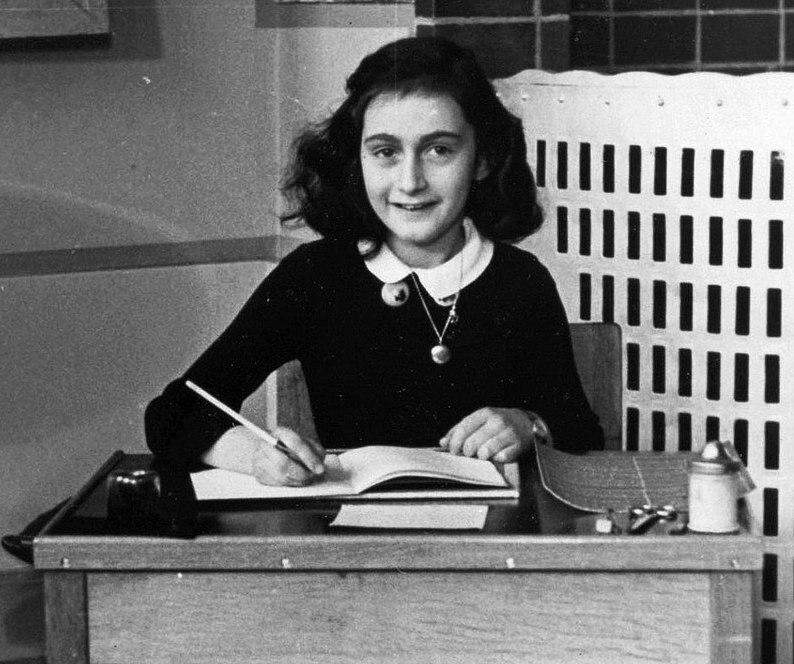 Anne Frank was a refugee from Frankfurt who lived in hiding in the Netherlands during World War II. She began her famous diary, addressed to her imaginary friend Kitty, in 1942. Nearly 73 and a half years ago, you received what I’m sure you never expected to be your last letter from Anne. At the time that letter was written, Anne, along with seven other people, had been hiding in a secret annex between two buildings on a canal street in Nazi-occupied Amsterdam for over two years. As Anne’s closest confidant throughout her time there, you must remember all the food shortages, the constant quarrels and the many near-discoveries that characterized daily life in the annex. However, as your perspective of the annex was shaped solely by Anne’s, you must recall with even greater clarity those times when Anne was bursting with joy, hope and benevolence and especially the immeasurable goodness and love with which a small group of non-Jewish friends sustained Anne and her comrades. You were a much-needed ear when no one else could spare a moment to listen in the chaos of war, and you were an endless source of comfort when Anne needed it most. Above all, you recorded one of the most poignant and moving memoirs to be produced during World War II. For people like Anne, the darkness must have seemed nearly complete. I sincerely can’t begin to imagine the horror in which Anne and millions of other people lived during this war. Looking back on the war from a distance, it’s far too easy to desensitize oneself to the suffering, violence and inhumanity that rocked the world and left it shaken and recovering for decades. It’s far too easy to look through the modern lens and simplify the Second World War into a conflict, and a great one at that, but no more. And yet, it’s an abrupt reawakening to consider—truly consider—what life was like for the millions of refugees and orphans of the war. These men, women and children came from all walks of life and were of all nationalities and religions. Yet they were bound together in a whirl of unending uncertainty, distrust and lies, of famine and epidemic and death, closing in, as immense and inescapable as night. The facet of wartime life I personally find most difficult to imagine, Kitty, is the simple reality of not knowing what the future holds. For people like Anne, the darkness must have seemed nearly complete. With the sweeping and lightning-fast victory of the Nazis in places like the Netherlands, the German Wehrmacht must have appeared unstoppable, and as Jews and other “undesirables” disappeared in staggering numbers, the terrible fate of many, especially refugees, must have seemed immutable. In short, I cannot fathom how people retained a sense of hope and kept going when their lives seemed almost certainly doomed to destruction. But here’s the amazing part—they did. In the face of this great suffering, these people whose lives had been shattered by conflict defied defeat. They refused to give in and kept fighting until their fears had been conquered. Even after the war, they worked to rebuild their nations and cities from the ground up. Faced with a multitude of evils, Anne took a rather Ignatian outlook, thinking of all the beauty left around her. Faced with a multitude of evils, Anne took a rather Ignatian outlook, thinking of all the beauty left around her and trying to remain content. In addition, she wished to become an author after the war; in particular, she desired to publish her correspondence with you, in the hope of providing a firsthand account of the barbaric persecution of the Jewish people under the Nazi regime. And I guess, Kitty, this wish has been fulfilled, though in a tragic way. However, the publication of Anne’s letters to you gave us so much more than a mere account of the war. It gave us a candid and completely innocent view of a young girl growing up as a refugee, complete with all of her thoughts, emotions and desires, and a distinctive and often humorous voice. Very impressive, don’t you think, Kitty, for a teenage Jewish girl in hiding during Nazi occupation? On the surface, Anne’s situation seems to be the epitome of hopelessness. And yet, against all odds, she fought back, shaping her own identity and refusing to let her gender, age or religion get in her way. Even after her death, Anne’s memory lives on. She is, in effect, the face of refugees everywhere. Even after her death, Anne’s memory lives on. She is, in effect, the face of refugees everywhere. She and her family were, in the blink of an eye, forced from their home in Frankfurt for their beliefs and carried away to Amsterdam. Refugees around the world today face the same problems. As conflict rages like a festering disease in many regions across the world, millions upon millions of people are unceremoniously uprooted from their homes. Recalling the story of Anne, it is impossible to forget the many helpers who daily risked everything—their lives, jobs and families—to support and conceal the whereabouts of their charges. However, in looking at the stories of today’s refugees, the positions once filled by Miep Gies and Bep Voskuijl, who did so much to help Anne and her family, have yet to be taken. On the contrary, there is an alarming, growing anti-refugee sentiment. Numerous leaders around the world with strong views on this matter are finding an increasingly large collection of listeners, and aid efforts are grossly underfunded. Thus, many refugees are forced to flee, not to the safer and more prosperous West, but to the nearest moderately stable country. These nations, unequipped to manage such increases in immigration, are taxed to the breaking point. Countries like Lebanon, Greece and Turkey simply cannot handle such immense influxes of refugees. And still, be it out of fear, out of prejudice or out of simple self-interest, many with the resources to aid these helpless people turn their backs on them. Too often, we refuse to see these people as people. Instead, we choose to see them as problems that need to be dealt with quickly and efficiently. Too often, the way we deal with these “problems” is simply by passing them on, by handing them off to others. But all people must cry out against this! One need only look at Anne to see the plight of the refugee: unwanted and unloved from so many sides. With this image of need in mind, how could we possibly refuse our aid to any man or woman without a place to call home? We must be like Miep and Bep and all those other good souls who welcomed Jews at their own peril, and welcome the Anne Franks of the world into our lives today! When confronted with people in need, we are obliged to find the beauty underneath the surface and to appreciate our many differences because, in spite of everything, these differences draw us together more than they pull us apart. Like the hundreds of pieces of a jigsaw puzzle, we all fit together in unique ways. As distrust of refugees threatens to strangle many communities in our world, we must be the voices for those who have none. As I’m sure you’ll remember, Anne frequently mused that paper is more patient than people. Paper is, after all, always willing to listen quietly and not to judge. Would it not be wonderful if people tried, just once, to be like this, too? Acceptance of anybody, from our closest neighbors to refugees fleeing distant conflicts, begins with an open mind, just as the great tales of the great writers were born from empty parchment. I wonder, Kitty, would it not be world-changing? Yes or no, I’m sure we both know what Anne would say. Thank you, James Chapman. You keep Anne Frank alive today. You keep the Christian imperative of decency, refuge, and justice before us. Thank you. April 13, 2018 I wrote my comment last evening. This morning I read in the NY Times of a survey of US citizens about their knowledge of the Holocaust. The numbers among us, especially Millenials, who have no knowledge of it are astounding. Mr. Chapman's essay will hopefully help to reverse that sad statistic. Well done! A sensitive, historically-informed piece of work. This article also appeared in print, under the headline "A writer and a refugee ," in the June 11, 2018 issue. James Chapman is a sophomore at Creighton Prep in Omaha, Neb.